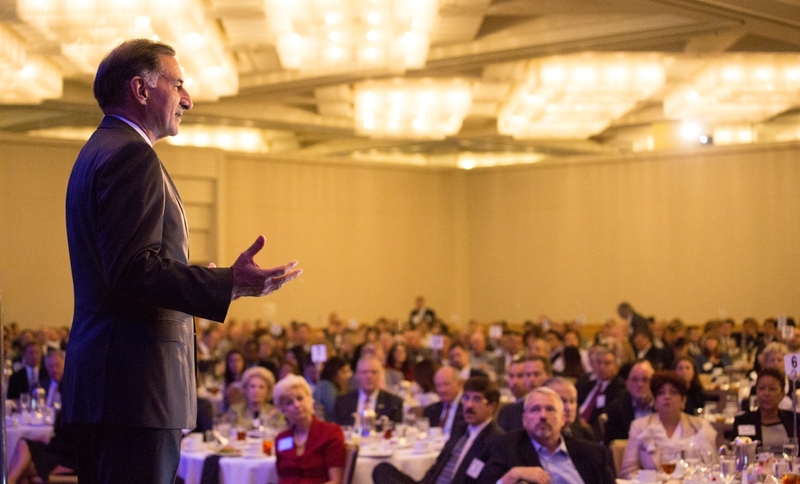 CSUF Provost and Former Dean Anil Puri delivers the economic forecast report at the Hotel Irvine on Nov. 2 to an audience of local business professionals, economists and members of the Titan family. Photo by Matt Gush. 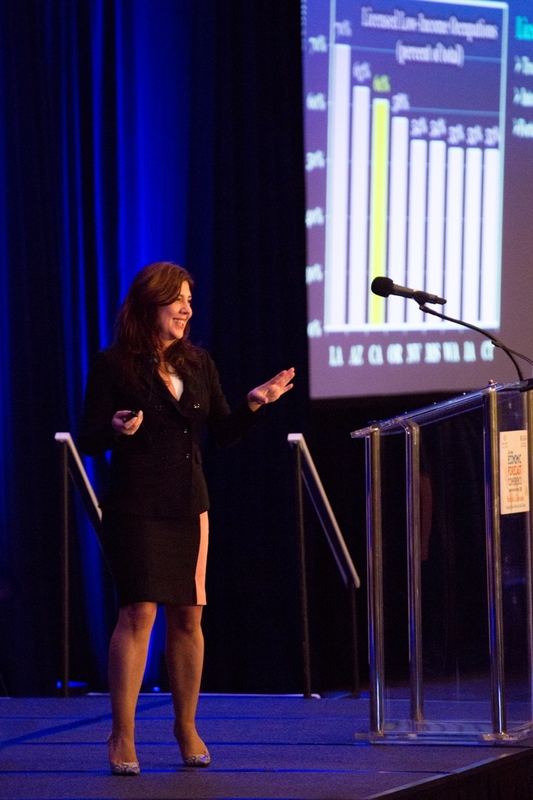 Former Mihaylo Dean and CSUF Provost Anil Puri and Mihaylo Associate Professor of Economics Mira Farka presented their annual economic forecast on Nov. 2. They discussed the local, national and global economic outlook in light of structural headwinds and news shocks impacting macroeconomic performance. Puri and Farka note that the new millennium marked the beginning of a lower growth era for the economy of the U.S. and other developed countries. While the American economy grew at a 4.4% average annual rate from 1950 to 1970 and a 3.2% annual rate from 1970 to 2000, the rate has declined to 1.9% since 2000. Stagnant income and low labor market growth are manifestations of this trend. Mihaylo Associate Professor of Economics Mira Farka says economic growth should continue in coming years, but not at the high rates experienced during the second half of the 20th century. Photo by Matt Gush. Trade and globalization have benefited many by lowering the cost of consumer goods. Puri and Farka report that a shutdown of global trade would cause the poorest 10% of consumers to lose almost two-thirds of their purchasing power. Yet a significant dislocation in employment has occurred. Manufacturing employment in the U.S. fell by 1.5 million between 1980 and 2000, but by another 6 million since the turn of the millennium. About a fifth of the losses were due to direct competition from China alone, though the majority of losses are due to technological advances which have eliminated many blue and white collar positions. Looking ahead, Puri and Farka do not anticipate a recession. But they don’t foresee spectacular growth either. 2016 began with paltry growth and fears of a downturn, though the economy performed better during the second half of the year. Still, with an expected rate of 1.5% U.S. GDP growth for the whole of the year, 2016 is likely to be the weakest growth year in the past three, with consumer spending the primary catalyst of economic expansion. 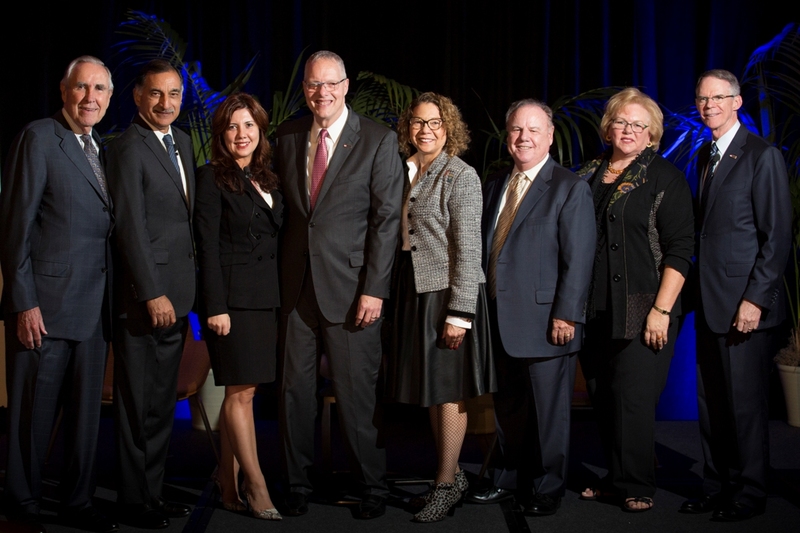 The economic forecast features Mihaylo and CSUF leaders and influencers from the local business community, including keynote speaker Richard Davis, CEO and chairman of U.S. Bancorp (far right). Photo by Matt Gush. Over the next few years, the two expect growth to continue, though at only 2.2% in 2017 and 2.0% in 2018, far below the average of 3% to 3.5% that was observed over the past half century. Real median income remains below the 1999 peak but is well above the abysmal showing of the Great Recession for most subsets of the population. Homeowner equity has also recovered strongly, with $6.7 trillion of the $7.5 trillion in home equity lost in the downturn now recovered. While the rate of job formation has declined in 2016, Puri and Farka see this as an expected result of a mature economic recovery. Job creation is expected to average 173,000 new positions per month in 2016, but this is forecast to decline to 160,000 in 2017 and only 148,000 in 2018. The Mihaylo report notes that this year’s presidential election is seen as an anomalous headwind for the economy. Yet they do not see reason for panic. “Political uncertainty is always a risk in election years and this cycle is unquestionably unusual. But our view is that uncertainty is a bit overdone and the impact of the election on the market and the broader economy will likely be more muted than what the intensity of the campaign rhetoric suggests,” noting that election winners are forced to work with Congress and compromise, significantly softening the sometimes vitriolic discourse. The Federal Reserve’s decision to raise interest rates late in 2015 marked an end to seven years of a near zero federal funds rate. Yet no rapid rise in rates is expected, with only one rise expected in December, two in 2017 and two more in 2018. While doom and gloom seem to have been averted with the consequences of the Chinese economic slowdown and Brexit relatively muted, global risks remain. “Any adverse event, large or small, is likely to produce amplified shockwaves around the world,” they note. Puri and Farka anticipate continued growth in the Southern California economy, with optimism indicated in their survey of local businesses. Housing prices have recovered nearly their entire decline during the Great Recession, construction activity continues to accelerate and total employment in Orange County has exceeded its pre-recession peak. Southland unemployment is expected to fall to 4% or below in Orange County during the next two years and to 5.6% by 2018 in the Inland Empire. Housing prices are expected to increase by about 6% in 2017. For more on the Woods Center for Economic Analysis and Forecasting or to read the full report, visit the center online. The center provides a midyear report and regular interim studies in addition to their annual forecast.